Colliding worlds, epidemics, vampires, aliens, zombies, writers just love ending the world and we just love reading about how it all goes down like it does in Swan Song. Everyone dies, except us–or those characters who are our surrogates. One particularly gruesome ending has fallen out of favor–World War III with its mushroom clouds. The President in the War Room agonizes on whether or not to take the Ruskies with us into that bad night of a nuclear winter. He always does. 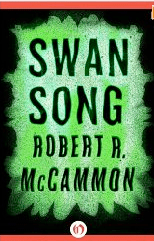 Because the world is different now from the world of the mid-eighties when McCammon wrote Swan’s Song, what limited appeal this novel possessed has all but evaporated. I’m a boomer and all boomers relate to the fear of global nuclear war; we grew up with it. McCammon renders the nuclear nightmare in vivid detail. He focuses on characters struggling to free themselves from environments that saved their lives, but now threaten to become tombs. One particular bit of irony is a survivalist enclave dug into a mountain. There’s a gym, a movie theater, apartments, etc. As always,the best laid plans go down. A whole mountain collapsing on you–take that survivalists. No control of your fate–all luck of the draw. Unlike Stephen King‘s The Stand, another end-of-the world scenario, we’re not invested in McCammon’s characters. I think that’s because he devotes so much of the novel to showing us how devastating an all out nuclear war would be, not just to humans, but to everything. It’s hard to say who the protagonist is. I guess it would be Swan, a young girl who can talk to plants. It is Swan who will save the world by giving pep talks to trees, grass, crops etc, spreading seeds and re-growing where ever she goes. She’s a kind of “Swannie Appleseed.” Sorry, I couldn’t resist. The antagonist, similar to The Stand‘s Randall Flagg is a devil with a small “d.” The devil keeps whining about how it’s now “his” party and he gets to decide what happens, which is everybody and everything dies. I kept wondering–if the devil gets his way, what will he do for entertainment when everyone is gone? Of course he doesn’t win–Swan has his number and puts him in his place. Unfortunately, Swan Song was long–way too long–over 800 pages. McCammon could have carved out at least two hundred pages of that fruit-and-nut ingredient necessary to every apocalypse mix–the military mad men, the crazies and the religious zealots. The battle scenes were detailed and endless. In terms of characters–there’s lots of pat psychoanalysis but not much in the way of real people to care about. Like King’s The Stand, McCammon’s Swan Song indicates he doesn’t care a lot for the military or much in the way of government. I know McCammon can write–I read Boy’s Life years ago and it was such a pleasure. I intend to read some of his other novels and expect I’ll enjoy them. One thing–I’m glad that threat of a nuclear winter is diminishing. On top of everything, there would be nothing to eat, unless of course you’re a zombie. Since writing this review, I have read several more novels by Robert McCammon, including all of the Matthew Corbett detective series. I’m looking forward to reading more Matthew Corbett stories as well as any other new works by McCammon.